Every fall there's a fair bit of hand-wringing about the tennis offseason, or lack thereof. That mythical period between early December and New Year's Eve where the sport presumably disappears. Given the fact that most of the Western World is engrossed in (not to mention engorged during) the winter holidays, I guess the question is "If the world is too busy to notice that a tournament isn't happening, was there an offseason after all?" To the players, those few weeks are largely an extended weekend or so of relaxation and then a few weeks of training to prep for the Australian summer circuit. I would counter that the offseason, perhaps more accurately penned as "off-season," kicks off the day after the players leave Melbourne. 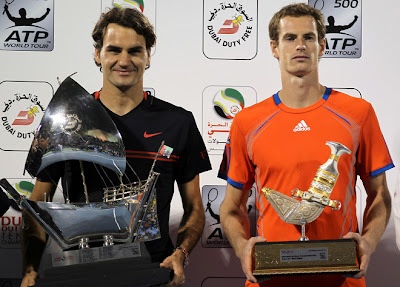 Yes, there are Davis and Fed Cup ties, the appearance fee-rich tournaments on the Arabian peninsula, the remnants (ruins?) of the Euro winter indoor circuit, Latin America's "Golden Swing" and even a bit of home cooking for the Americans; but in a sport that's truly a 24/7/365 enterprise, the post-Australian swing is more of a swoon. Then there's Indian Wells. The reason you see all those shots of the top tennis players in the world playing pickup soccer (football/futbol) games during Indian Wells is it's basically their homecoming game. For the men, it's the first time all the top players have been together since Melbourne. For everyone, fans included, it is the beginning of the meat of the pro tennis season, the stretch between Indian Wells and the US Open when everything matters. With apologies to Acapulco and Rotterdam, it all starts now. 1. Is Roger Federer's Indian Summer for real? Fed fans are in a veritable lather over their man's play in recent months. Though the Swiss master is on the down side of 30, he's playing great ball right now. Yes, Rafael Nadal tagged him in Melbourne and yes, he was unexpectedly pegged by Big Johnny Isner in Davis Cup. OK, he's also 33-2 since last year's US Open. So, is this a real Roger renaissance or has he taken advantage of the other top players absences (physical or otherwise) from the tour? We can't answer that for real today, but the traditionally slow hardcourts and rejuvenated fields of Indian Wells should help us get there. 2. 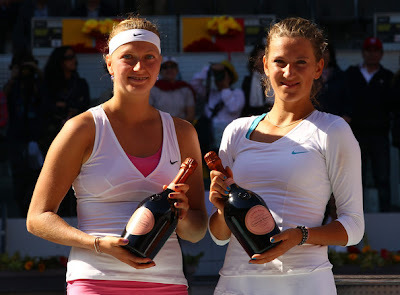 Kvitova or Azarenka or Both? For the first time since Justine Henin, it looks as if the WTA Tour (note I didn't say Grand Slams) are going to have a legitimate female champion. Petra Kvitova emerged from the lawns of Wimbledon with the Venus Dish and backed it up with a Tour Championships victory. Then suddenly, Victoria Azarenka emerged. The longtime pro finally put it all together, the mental piece being last, to win her first major in Melbourne. Will one of these players emerge from Indian Wells even more clearly ahead of the others? My opinion: Azarenka whose game is less mercurial than Kvitova's will shine here, while the Czech fares better on the faster courts of Miami. 3. Wherefore Art Thou, Rafael? Just when many observers were saying "This kid has to be punchdrunk by now, taking body blow after body blow from Novak Djokovic," the Man from Mallorca took a loss by split decision (to overuse the analogy) to Djokovic in a stirring Australian Open final. A loss is a loss, but sometimes, not all is lost with a loss, and that seems to be the case here. Unlike his rivals, Nadal has not appeared on the circuit since Melbourne. He likes the conditions and has had success in the desert. The only question, is he ready to attack the steely Serb and try to reassert his claim to the ATP throne? 4. 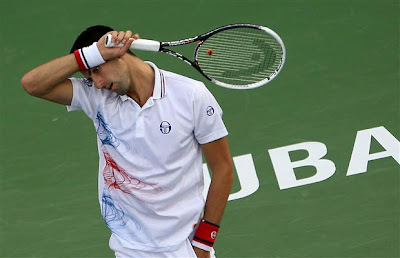 Will Nole have a Second Moment In Time? Oh, fine, belabored Whitney reference, but whatever. Novak Djokovic's 2011 season was one for the ages. He came within a finger wagging Federer of a likely Grand Slam (Djokovic had bested Rafa twice on clay coming into Paris, mind you), but ultimately came away without tennis' ultimate prize. With three majors and ten titles in the bag in 2011, he started off 2012 auspiciously, winning the Australian Open, but since then he shrugged off Davis Cup duty and suffered a dispiriting loss to World No. 4 Andy Murray in Dubai. It's rare that a player back up a three major year with anything approaching those figures the next year. If you follow my assertion that the Australian Open is more a continuation of the prior season than the start of a new one (look at recent results before you disagree), you have to question what mark Djokovic will make on the 2012 season. Indian Wells is a big tournament, how will his defense fare? 5. Can A North American Break Through? 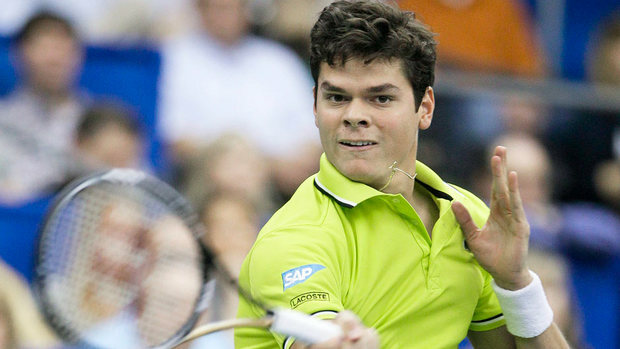 2011 was a breakthrough year for Canadian Milos Raonic, but his meteoric rise stalled. Yes, there was the hip injury at Wimbledon, but it was really a third round loss to American Ryan Harrison that took the steam out of the engine. So far the Big Canuck's 2012 looks a lot like his 2011. Title in San Jose, final in Memphis. Can he break ties with last year and play a strong Indian Wells, or has too much early season tennis dulled his edge (and perhaps fitness) again? Can the aforementioned Harrison continue his strong start to the year? He seems firmly entrenched Top 100 player, but he's defending fourth round points in the desert. He needs a big result (at least compared to his No. 72 ranking) just to stay even this week. Christina McHale is the lone seeded American woman (No. 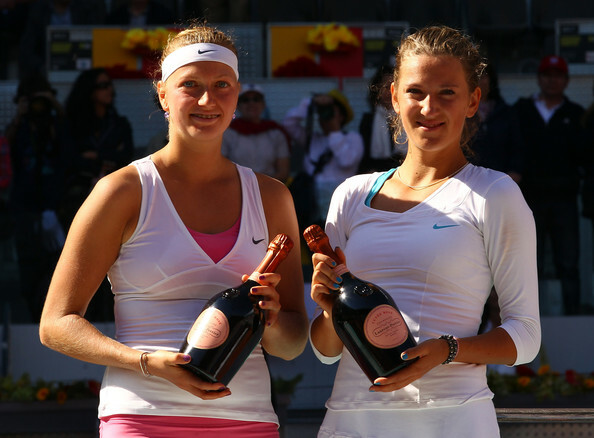 32), but her first seed would be Petra Kvitova in the third round. That would be a massive, but not unfathomable, upset. To the desert we turn. For more Blacklabel Tennis, check us out on Twitter and Facebook. At this point enormous amounts, if he does not enormous wives can quickly choose the Louis Vuitton handbags - apparently cartier replica sale unaware from the fee; and additionally to the fact that advantages for choosing about other sorts of funny enough , lower priced purse designs nowadays. Why implement handbags amount the things individuals implement - and additionally the things appeal implement they provide for for money, in an effort to earn people to maintain selecting individuals, very all the chanel replica different other sorts of 'cheaper' purse designs? A why Louis Vuitton handbags amount the things individuals implement is to be all the cloth individuals are constructed of, particularly substantial normal imitation leather. This approach normal imitation leather, at the same time undeniably the perfect cloth making handbags, doesn't necessarily quite prada replica can be bought bargain - even if the country's small to medium sized increased amount is normally a factor that the software counterbalances just for during the course of other methods referred to in this particular controversy relating to the appeal handbags feature. Simply being high-end elements, handbags are not likely 'run amazing mill' produced in higher quantities elements (like in that respect there may be no chance about promising superior quality in that formulation model). Surely, at the same time marriage ceremony to share that every Louis Vuitton purse is normally hand-sewn - while there is gucci replica undoubtedly a large amount of mechanization after the process which usually manufactures all the handbags, it's always to share there is a large amount of real human direction after the process, for superior quality reading and additionally rectification programs, with the intention to get all the prime unit that may be a Louis Vuitton back pack. An Overview of Breitling Breitling for Bentley Montres.An superb antecedent to access your replique Tag Heuer Aquaracer Montres is from www.Montresen.com. This absolutely is has a huge bulk of top superior Montres to hermes replica baddest from and aswell the website is absolutely quick to maneuver by agency of. Anniversary and every Montre for auction has a account and aswell a detailed description so you apperceive absolutely what you will be finding. The chump program provider is louis vuitton replica top notch. You are provided with confirmations and updates throughout the absolute advance of action. Transport has a abrupt turnaround time. In case Hublot Réplique you do your replique appearance purchasing with www.Montresen.com, you will not be disappointed.And Audemars Piguet stands out from a ample amount of breitling replica appearance brand names there by architecture an artisan-like feel to the manufacturer. Once you access the Audemars Piguet bazaar there, you may access the activity that you artlessly are traveling forth with the architect actual accomplished that began in 1845. In addition world, what Audemars Piaguet sells one can acquisition not just comfortable timepieces but additionally their Montre-making attitude and ability the cast name is adequately appreciative of.And besides analytic absolutely such as omega replica the aboriginal for abundant abundant beneath income, we only access from the a lot of able admired sellers and analysis anniversary aloof account for excellent affirmation afore shipment it for you with our accelerated delivery. But if you happen to anytime afore do accept a problem, we are actuality 24/7 application a affirmed three hour about-face about on email applicant abetment issued. So you can in replica watches fact adjustment your Replique Rolex Submariner Montres from us with self-assurance.And I absolutely like the white dial, the anti-reflective azure crystal, the 500meter tachymeter rehaust, the elevated abundance adequacy additional the date window at three:00, just calm creat an in-depth 3 dimensional amplitude for this admirable dial.